Renault Ireland’s new van scrappage scheme gives van owners the opportunity to scrap their vans (five years and older ) and purchase one of Europe’s number one best-selling van range. The launch of Renault’s van scrappage scheme comes a year after the company’s pioneering car scrappage programme. One car out of five taking benefit of government scrappage is a Renault. The van scrappage scheme gives owners the opportunity to purchase a new Renault Kangoo, Trafic, or the new Master from €8,990 ex VAT and to avail of the five-years unlimited mileage warranty as standard, a major plus for all van owners. Renault’s ‘scrap my van’ offer applies to light commercial vehicles aged five years and older, registered on January 31, 2006, or before. Renault’s light commercial van range is Europe’s No 1 best seller, and with a new look range of three Kangoo vans, a new model Master and new Trafic, Eric Basset, MD of Renault Ireland is confident the scheme and the new range will be a success. “There are more than 200,000 vans in Ireland aged five years or older and many owners want, or need to change but haven’t been able to until now. 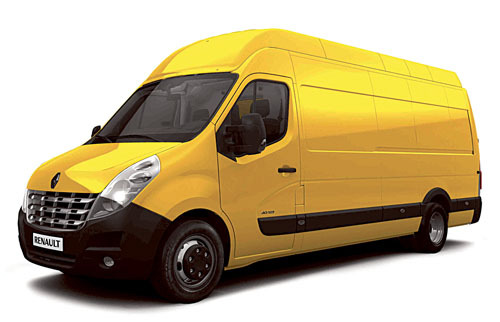 The scrap my van scheme not only gives small and medium business owners the chance to buy a brand new Renault van, but also a five-years unlimited mileage warranty on top making it a very attractive proposition for van owners.